SEA's links to 'appropriate assessment' of plans under the European Habitats Directive. Employing a host of real-life case studies and examples, each chapter presents a range of techniques and discusses what the final product should look like. Appendices provide a wealth of additional information including text of the SEA Directive and the UNECE Protocol on SEA, and a 'toolkit' of SEA techniques. 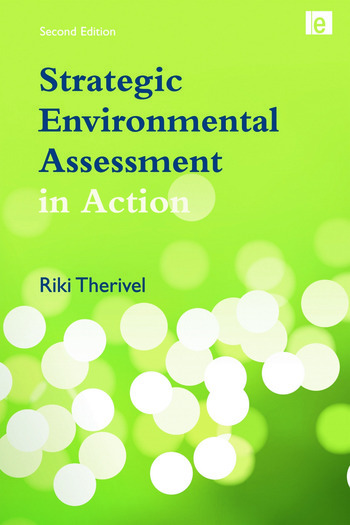 The approach and techniques in Strategic Environmental Assessment in Action are useful for anyone carrying out or studying SEA at any level, from policy to programme, international to local, but particularly for practitioners responsible for implementing the SEA Directive. Riki Therivel is a partner with Levett-Therivel sustainability consultants and a Visiting Professor at Oxford Brookes University's School of the Built Environment. She is the co-author of The Practice of Strategic Environmental Assessment (1996) and Strategic Environmental Assessment (1992).